Wish I knew what town this was in. YouTuber Joey Salads decided he wanted to find out what would happen if he left a car in a predominately black neighborhood with Trump stickers all over it and Trump paraphernalia on the inside as well. It didn’t take long for predictable results to occur… just thirty minutes or so. A black guy, that frankly I couldn’t understand, came by to check the car out. He was on his phone. He found it was open and briefly got in and then left. Fifteen minutes later, he returned with his buds and it was party on. 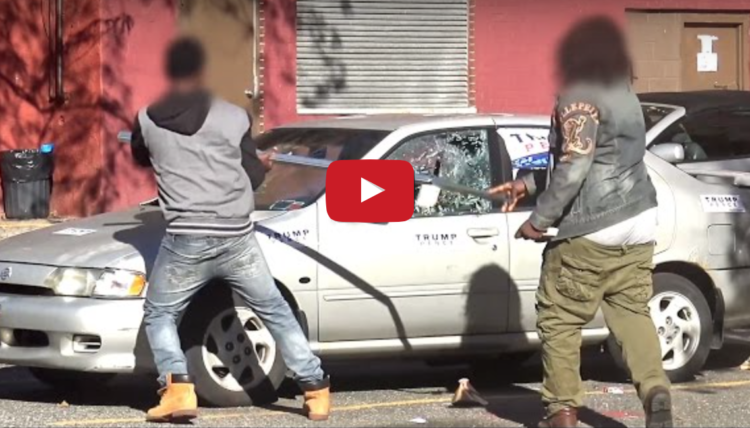 This social experiment got the car totally destroyed. Five guys, whose pants kept falling down, went to town on that car, yelling ‘F*ck Trump!’ People were leaning out windows yelling the same profanity. They tore the stickers off, threw out the cap and took rocks to the windows to bust them out. They were simply thrilled over it. Salad smudged out their faces so you can’t see who did it. Too bad… they should all be locked up. YouTube personality Joey Salads left a car laden with Trump paraphernalia in a parking lot of a “black neighborhood” and let a video camera capture what happened next. It took 30 minutes, according to the YouTube video, for locals to ravage and loot the car. The YouTuber did not identify what city his ‘social experiment’ took place in. Joey Salads said bystanders did nothing to stop the group instead opting to cheer them on with ‘F*ck Trump’ chants. JOEY SALADS: As you can see from this video, the black community is very violent towards Trump and his supporters. As I was filming this video, there were people shouting out their windows, ‘F*** Trump.’ After filming I talked to some of the spectators who are black, who said that they did low-key support Trump, but they were afraid of the backlash from their community. Salad claims there were black bystanders that quietly supported Trump, but they feared backlash from the community. I’m sure that is very true. I doubt this would happen in every neighborhood like this, but there is a good chance it would happen in most of them. For some reason, these young people seem to think that the Democrats are their champions. They have obviously never really studied history, because nothing could be further from the truth. Regardless of which candidate that wins this time, there will be more violence in the streets. After eight years of Obama, the chaos is primed and ready to erupt. This video is a sad testament regarding America’s condition as a nation.